Barbarik was the grandson of Bhima and the son of Ghatotkacha. Barbarik was supposed to be a brave warrior having learnt the art of warfare from his mother. 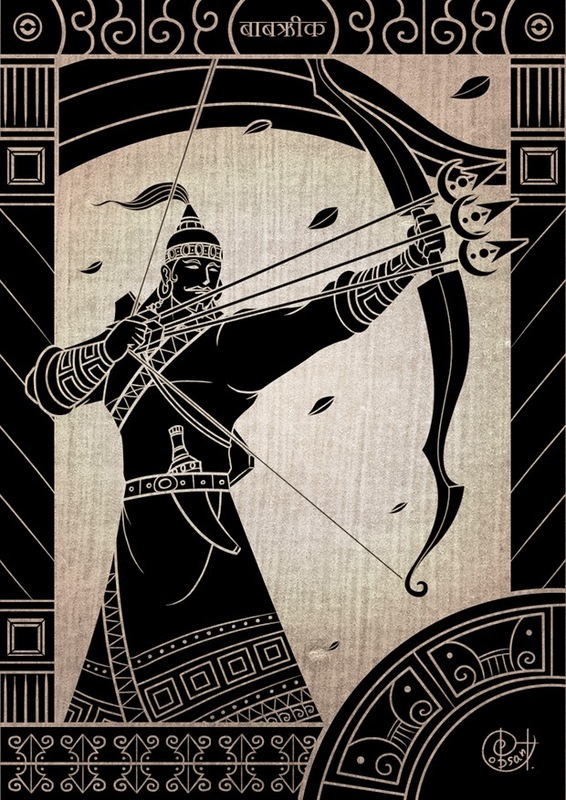 Lord Shiva pleased with Barbarik’s talent as a warrior granted him a Three special arrows. He also got a special bow from Lord Agni (God of Fire). Before the war started, Lord Krishna asked everyone how long would it take for them to finish the war alone. Bhisma replied it would take 20 days. Dronacharya said it would take 25 days. Karna said it would take 24 days whereas Arjuna said it would take him 28 days. Barbarik had expressed his desire to watch the war of Mahabharata to his mother. His mother agreed to let him go watch it, but asked him before leaving as to which side he would join if he felt the urge to take part in the war. Barbarik promised his mother that he would join the side that was weaker. Saying this he set up on the journey to visit the battlefield. 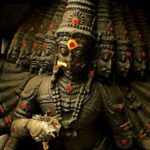 Krishna having heard of Barbarik and wanting to examine Barbarik’s strength disguised himself as a Brahmin came in front of Barbarik. Krishna asked him the same question about how many days would it take to finish the war if he were to fight it alone. Barbarik replied it would take him only 1 minute to finish the battle if he was to fight it alone. Krishna was surprised at this answer of Barbarik considering the fact that Barbarik was walking towards the battlefield with just 3 arrows and a bow. To this Barbarik explained the power of the 3 arrows. The first arrow was supposed to mark all the objects that Barbarik wanted to be destroyed. The second arrow was supposed to mark all the objects that Barbarik wanted to be saved. The third arrow was supposed to destroy all the objects marked by the first arrow OR destroy all the objects not marked by the second arrow. And at the end of this all the arrows would come return to the quiver. Krishna eager to test this out asked Barbarik to tie all the leaves of the tree that he was standing under. As Barbarik started meditating to perform the task, Krishna took one leaf from the tree and placed it under his foot without Barbarik’s knowledge. When Barbarik releases the first arrow, the arrow marks all the leaves from the tree and eventually starts revolving around Lord Krishna’s feet. Krishna asks Barbarik as to why the arrow is doing this. To this Barbarik replies that there must be a leaf under your feet and asks Krishna to lift his leg. As soon as Krishna lifts his leg, the arrow goes ahead and marks the remaining leaf too. This incident scares Lord Krishna about the phenomenal power of Barbarik. He concludes that the arrows are truly infallible. 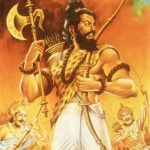 Krishna also realizes that in the real battlefield in case Krishna wants to isolate someone (for eg the 5 Pandavas) from Barbarik’s attack, then he would not be able to do so, since even without the knowledge of Barbarik, the arrow would go ahead and destroy the target if Barbarik intended so. To this Krishna asks Barbarik about which side he was planning to fight for in the war of Mahabharata. Barbarik explains that since the Kaurava Army is bigger than the Pandava Army and because of the condition he had agreed to with his mother, he would fight for the Pandavas. But to this Lord Krishna explains the paradox of the condition he had agreed with his mother. Krishna explains that since he was the greatest warrior on the battlefield, which ever side he joins would make the other side weaker. So eventually he would end up oscillating between the two sides and destroy everyone except himself. Thus Krishna reveals the actual consequence of the word that he had given to his mother. Thus Krishna(still disguised as a Brahmin) asks for Barbarik’s head in charity to avoid his involvement in the war. After this Krishna explains that it was necessary to sacrifice the head of the greatest Kshatriya in order to worship the battlefield and that he regarded Barbarik as the greatest Kshatriya of that time. Before actually giving his head, Barbarik expresses his desire to view the forthcoming battle. To this Krishna agreed to place Barbarik’s head on top of the mountain that overlooked the battlefield. At the end of the war, the Pandavas argued amongst themselves about whose was the greatest contribution to their victory. To this Krishna suggests that Barbarik’s head should be allowed to judge this since it has watched the entire war. Barbarik’s head suggests it was Krishna alone who was responsible for the victory in the war. His advice, his strategy and his presence was crucial in the victory.